Sketch E. No. 2, Showing the Progress of the Survey in the Vicinity of Savannah Georgia 1850 - 1852. An attractive hand colored 1853 U.S. Coast Survey triangulation chart or map of Savannah Georgia and the Savannah River. Shows the progress of the survey work in this area by date annotated sections. Shows navigation marks such as Fort Jackson, Tybee Lighthouse, Manigault's Lighthouse and even Manigault's Tall Chimney. Details the grid layout of Savannah city. The hand color work on this beautiful map is exceptionally well done. 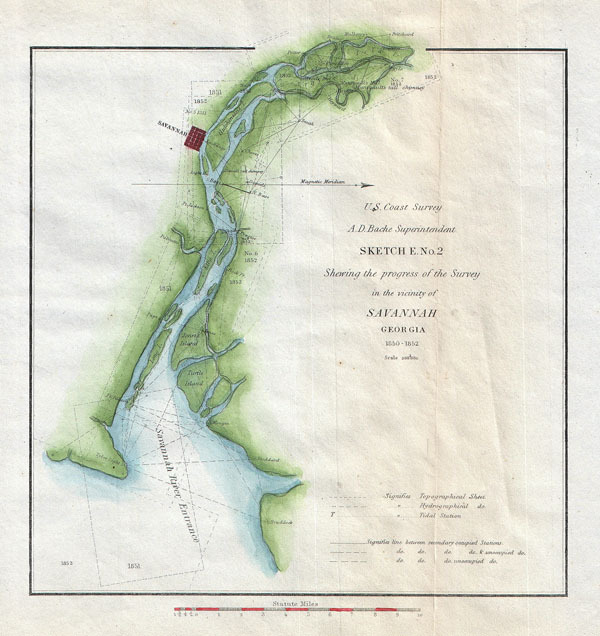 This map was compiled under the direction of A. D. Bache, Superintendent of the Survey of the Coast of the United States and one of the most influential American cartographers of the 19th century. Very good condition. Original folds exhibits light toning. Blank on verso.